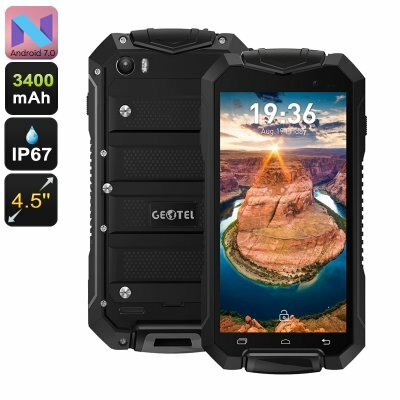 Successfully Added Geotel A1 Rugged Smartphone - Android 7.0, Dual-IMEI, IP67, Quad-Core CPU, 4.5 Inch Display, 3400mAh, 8MP Camera (Black) to your Shopping Cart. The Geotel A1 Rugged phone is the perfect smartphone for those of you that are looking for a merely invincible Android phone that does not only feature an extremely rugged design but also comes packed with the latest software and hardware alike. Not only does the Geotel A1 feature a rugged IP67 design that makes this Android smartphone resistance against, water, dust, and shocks – it also runs on the latest Android 7.0 operating system meaning it comes packed with the latest features and software. No matter where on the globe you’ll be headed, with this rugged phone at your side, you’ll be able to always enjoy a smooth and powerful mobile experience even while out in the harshest environments. Packing a sophisticated Quad-Core CPU that has been clocked at 1.3GHz, this rugged smartphone is capable of running all your favorite applications and mobile media. Simply head out to the Play Store to gain access to millions of the latest free to download applications. With 8GB of internal storage and the added possibility to throw in a 64GB micro SD card, you can be assured that the Geotel A1 always holds enough memory for you to store all your favorite media and games alike. Being able to carry along day’s worth of entertainment in your pocket guarantees that, with this Android smartphone at hand, you’ll never experience a single moment of boredom again. With its nice 4.5-Inch display, the Geotel A1 rugged phone lets you enjoy all features Android 7.0 has to offer in beautiful quality. No matter where your next adventure will take you; this 4.5-Inch smartphone allows you to enjoy movies, games, and mobile applications in great resolution even while out in the toughest of environments. Along with its 3400mAh battery, this rugged smartphone provides you with up to 6 hours of continuous usage time and an absolutely stunning 120 hours standby time – allowing you to head out with confidence as this tough Android phone packs enough juice to get you through multiple days of smartphone usage. Featuring two SIM card slots and supporting two IMEI numbers, this Dual-SIM smartphone lets you be connected to two network providers simultaneously. No long will you need two smartphones to separate your work and private life as the Geotel A1 smartphone along with its Dual-IMEI numbers allows you to be reachable on two phone numbers while using merely one device. Added to that, this Dual-SIM smartphone allows you to throw in a local SIM card whenever you’re heading abroad – allowing you to stay connected to friends and family back home at local internet fees. Additionally, the Geotel A1 rugged phone also features a sophisticated 8MP rear camera that lets you snap beautiful pictures of all those special upcoming moments in life – allowing you to recall memories once back home like never before. The Geotel A1 comes with a 12 months warranty, brought to you by the leader in electronic devices as well as wholesale electronic gadgets..
Just arrived and it seems very well made and strong great value and highly recommend.